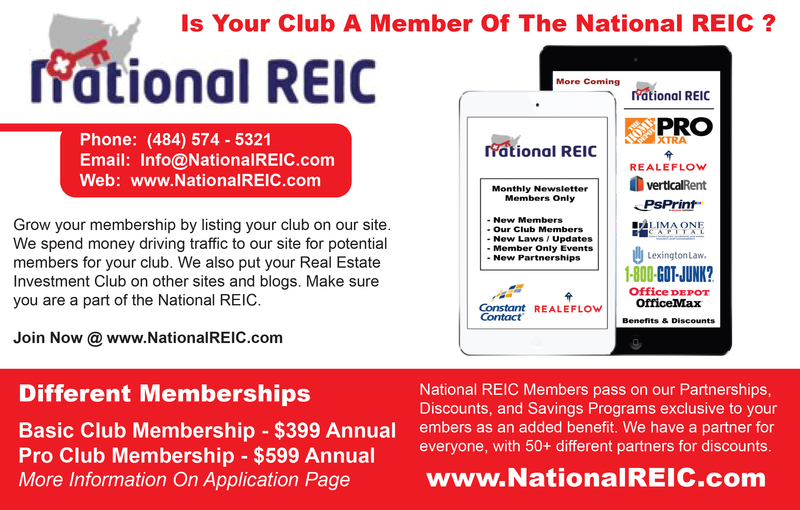 Join The National REIC Only $599. Get Member Benefits For Your Real Estate Investment Club Members, Only One Club Per County / Area. Grow your membership by listing your club on our site. We spend money driving traffic to our site for potential members for your club. We also put your Real Estate Investment Club on other sites and blogs. 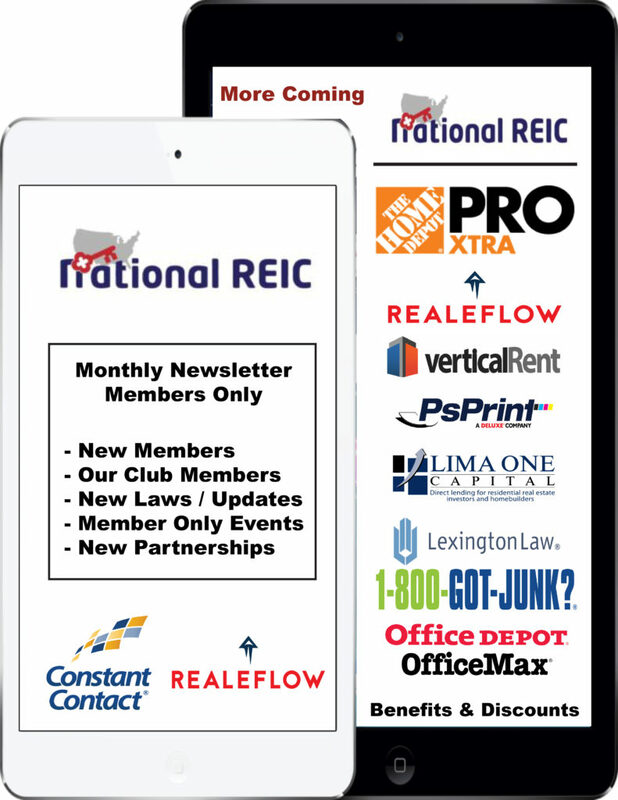 Make sure you are a part of the National REIC. Use Anything On Our Site To Promote Your Club and your member benefits after joining. Drive Buy REI - Driving For Deals, Doesn't Have To Be Complicated. No More Highlighters, Notebooks and Maps. We want to offer Real Estate Investment Club's an easy way to grow their membership by offering them benefits and discounts to their members. We want to help you gain members by helping potential members find your club online by posting your site in numerous places. We want people know they are joining a quality club, they are joining a member of the National REIC that will have great national speakers and offer beneficial discounts to members. We started this company as there was no inexpensive option for our club to join National Organization and become a registered member. We have been in the business of running and owning a Real Estate Investment Club for 10+ years and we are active Real Estate Investors. So we know the business from both sides. We offer a variety of reward product types from numerous businesses and a One-stop-portal to create, send and manage all your rewards and incentives Quick Setup. Finally I found a National Club that supports Real Estate Investors Associations. There are other groups out there and I have tried them, but they just turn out to be self serving companies that only care about the insiders. The NREIC is different. John Zwirina, Jeff Green and their team are really building a support structure to help REIA clubs grow and prosper. I am a proud member of the NREIC.